Winship Executive Director Walter J. Curran, Jr., MD, Omer Kucuk, MD, Ada Lee Correll, Pete Correll, and Chair of Hematology and Medical Oncology Sagar Lonial, MD. 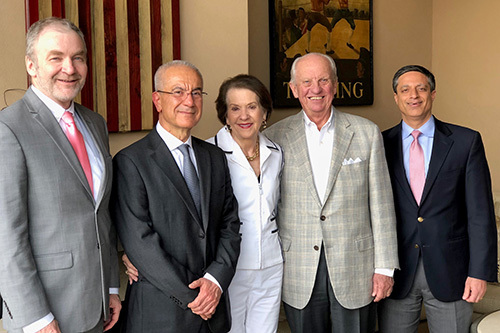 Winship Cancer Institute of Emory University medical oncologist Omer Kucuk, MD has been named the Correll Chair in Genitourinary Cancer, established by a gift from Ada Lee and Pete Correll, long-time supporters of Winship. Kucuk, chief of genitourinary cancer and professor in the Department of Hematology and Medical Oncology, joined Emory in 2008. A leader in integrative medicine, he has published over 200 peer-reviewed papers and delivered more than 150 lectures on his research, including lectures on nutrition and cancer. "We are pleased to honor Omer Kucuk with a distinguished position that recognizes his expertise and accomplishments in genitourinary cancer," says Walter J. Curran, Jr. MD, Winship's executive director. "His dedication to investigating the use of integrative medicine in the treatment of cancer has had a significant impact on cancer survivorship." Kucuk has been conducting preclinical and clinical studies with soy isoflavones, lycopene, and other nutritional and botanical compounds for over 20 years. He is investigating the effects of micronutrients and phytochemicals on biomarkers of cell growth, differentiation, metastasis, inflammation, oxidative stress, DNA methylation, and gene expression in a variety of cancers. His research also includes clinical studies on the epigenetic effects of botanicals, physical activity, and relaxation techniques such as meditation and yoga. "Ada Lee and I are thrilled to make this gift to honor Dr. Kucuk whom I credit for saving my life," says Pete Correll. "We will always be grateful for his medical expertise and appreciate his warm, caring manner." The Corrells are well-known throughout Atlanta and the state of Georgia for their generosity to a variety of charitable causes, including Emory, Grady, and the University of Georgia. Pete Correll is a former corporate executive who now serves as chairman of Atlanta Equity and is chairman emeritus of Georgia-Pacific Corp. Ada Lee Correll is an experienced volunteer fundraiser who has chaired countless fundraising efforts. A graduate of Hacettepe University School of Medicine in Ankara, Turkey, Kucuk completed his oncology fellowship at Northwestern University School of Medicine in Chicago. He is on the editorial boards of several scientific journals, including Cancer Epidemiology, Biomarkers and Prevention.